Mersenne Twister class for Monte-Carlo simulations. Provides the MersenneTwister implementation. The class is a header-only implementation. 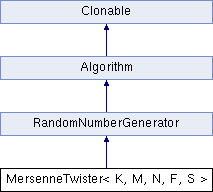 MersenneTwister is suitable for simulations, where uniformaly distrubuted numbers are required quickly. It should not be used for cryptographic purposes. Definition at line 29 of file mersenne.h. Definition at line 40 of file mersenne.h. Definition at line 45 of file mersenne.h. MersenneTwister uses the first 32-bits of input to reseed the generator. If fewer bytes are provided, then the seed is padded with 0's. Definition at line 52 of file mersenne.h. Bytes are written to output in big endian order. If output length is not a multiple of word32, then unused bytes are not accumulated for subsequent calls to GenerateBlock. Rather, the unused tail bytes are discarded, and the stream is continued at the next word32 boundary from the state array. Definition at line 69 of file mersenne.h. Generate a random 32-bit word in the range min to max, inclusive. If the 32-bit candidate is not within the range, then it is discarded and a new candidate is used. Definition at line 106 of file mersenne.h. Generate and discard n bytes. If n is not a multiple of word32, then unused bytes are not accumulated for subsequent calls to GenerateBlock. Rather, the unused tail bytes are discarded, and the stream is continued at the next word32 boundary from the state array. Definition at line 128 of file mersenne.h.